I’ve forgotten to do updates on my garden. For a while this summer, everything was growing well. I harvested a ton of green beans, edamame, and herbs, many of which are still in my freezer (the herbs in pesto sauce form). My tomatoes came in late due to the late planting so I was still harvesting them through October, and have some homemade sauce also in my freezer, although I mainly used them for pizzas. I didn’t get any squash or zucchini, due to squash bugs hopping from plot to plot in the garden and killing everyone’s plants. I only got a few bell peppers; some sort of bug got those as well. 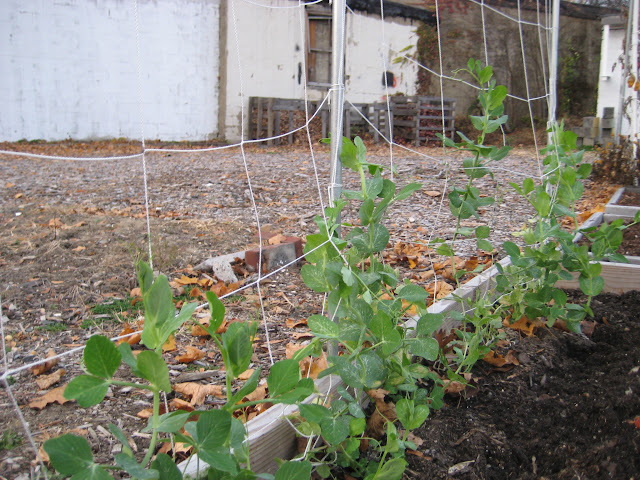 I did a fall planting (also late) of peas, radishes, lettuce, and kale. That was mostly a failure. 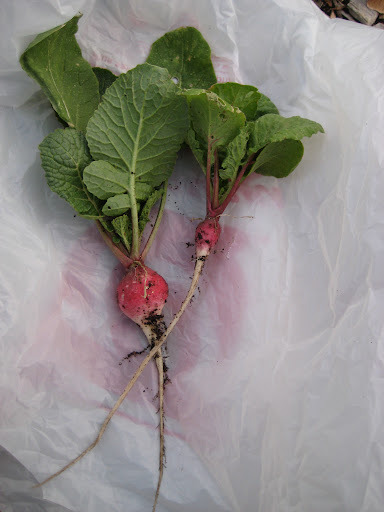 No lettuce or kale came up, and only two radishes. The peas are still growing although no peas have appeared. I’m leaving them growing and will see if anything shows up. 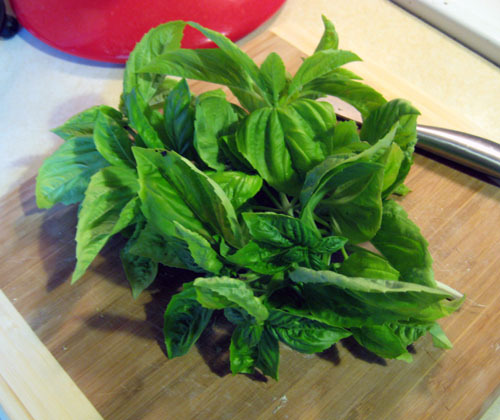 I do still also have most of my herbs, which I need to cut and dry very soon. 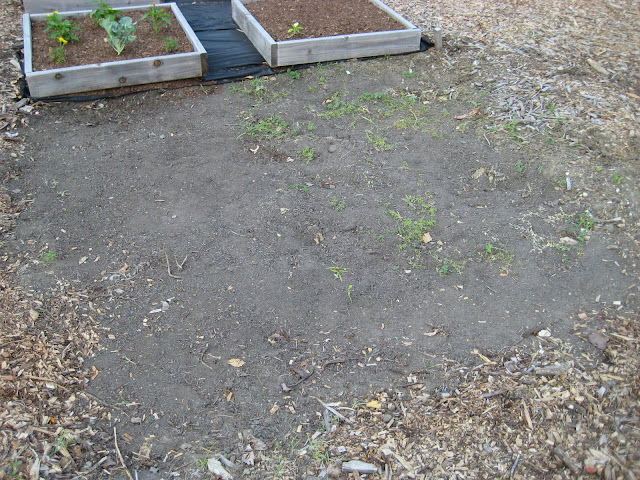 Otherwise, I’ve cleaned out the rest of my garden and tilled some rotting tomatoes back into the soil to compost. It was an interesting summer since I’ve never done my own vegetable garden before and didn’t expect so much of it to fail. There are no chemicals allowed in the garden so I’m not sure of other ways to get rid of bugs. I’m sure planting everything late didn’t help either. I’ve learned a lot for next time though! I’ve been on a mission since my trip to Ireland last summer to recreate the brown bread that is provided in nearly every single pub there. 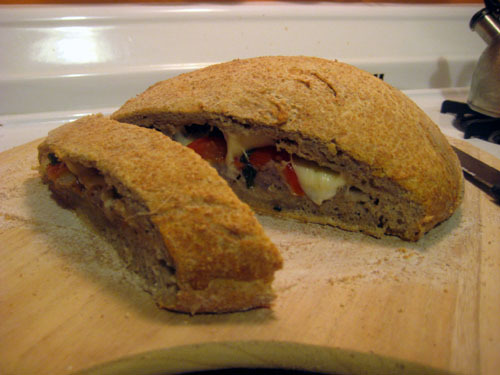 It was just so moist and delicious, perfect for going along with soup or by itself. 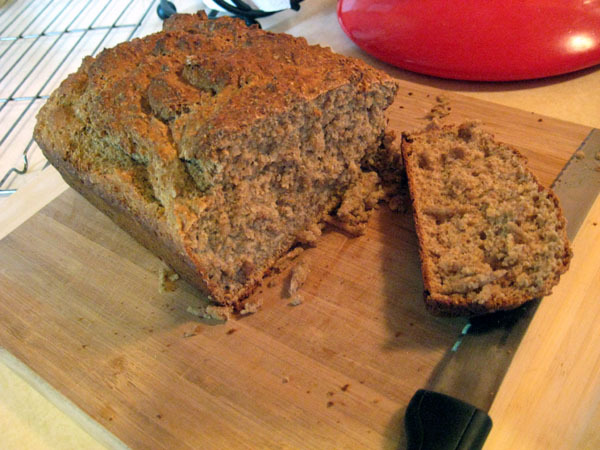 I had made Irish soda bread before, but this brown bread is a completely different animal. I tried several recipes, tweaked them, combined them, and finally figured out that the ingredients in the US are very different than those available in Ireland. Specifically, you need a coarse wholemeal flour. It’s very important. Using the standard finely milled flour widely available here will still taste good, but it’s not the same. I could not find it anywhere here, and didn’t fancy spending $12 on shipping to order it online, but I was able to bring some home from a recent trip to the UK. With a final recipe tweaking… success! Mix all dry ingredients together. Add wet ingredients and stir. Pour into greased loaf pan. Bake at 400F for 45-50 minutes. 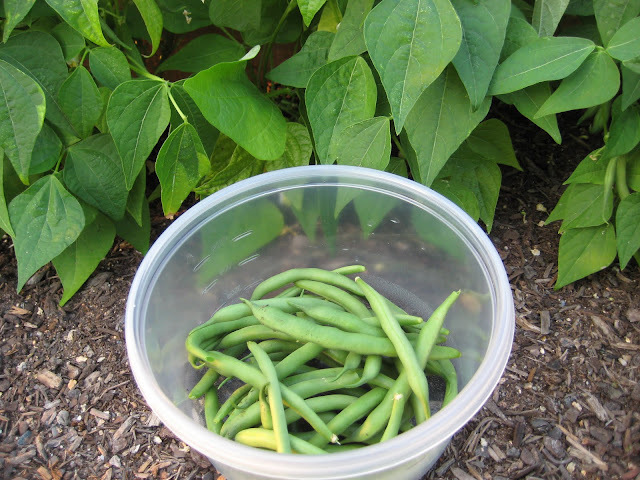 There are suddenly tons of green beans. The edamame bushes that I planted from seed are twice as big as the bean bushes I planted already started from the farmers market so now I’m wondering when those will start to pop out. 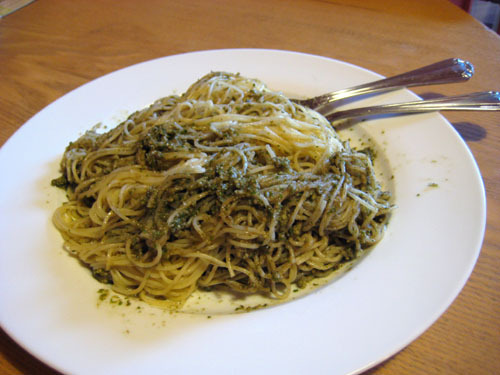 …to make my favorite pesto sauce. 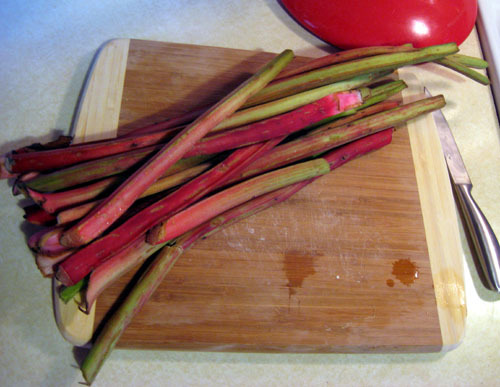 Since I got my garden going late, I missed out on rhubarb. Luckily, my whole family in NY has it coming out their ears and just sent a bunch down with my brother to distribute. …and I froze enough to make the lemon buttermilk rhubarb bundt cake from the same cookbook later. My town has a community garden. This is the second year they’re doing it and if you were in the first year, you had first dibs on the same spot for this year. I wanted to get in but I ended up on a waiting list since it was already full. If people hadn’t done anything with their plots by June 1st though, they got booted. Thankfully, someone else was lazy and I got their spot at the beginning of the month. 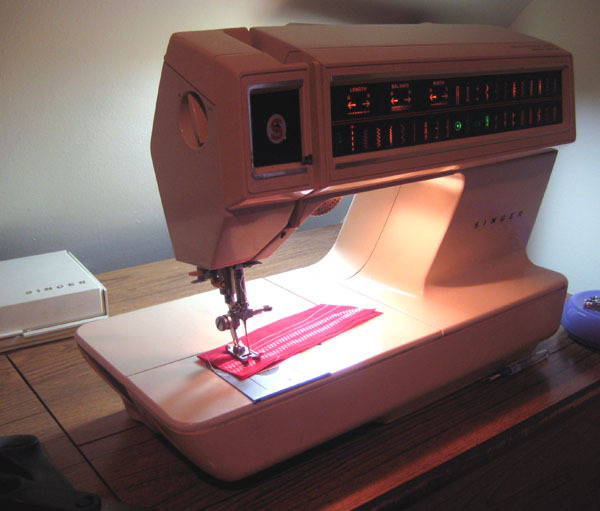 You start with an 8′ x 8′ plot. When they were starting the garden last year, people had to pickax their way into the ground. Apparently the lady who had my spot hired a high school boy to dig 20″ down and get out all the rock so I have a prime spot. 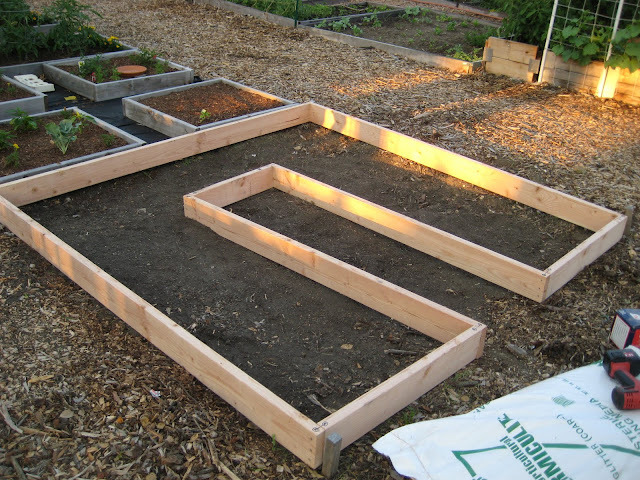 I wanted to do a raised bed but I needed to be able to reach all the plants so I did a U-shaped one. My dad helped me pick up the wood, cut and pre-drill it, so I just had to screw it all together. 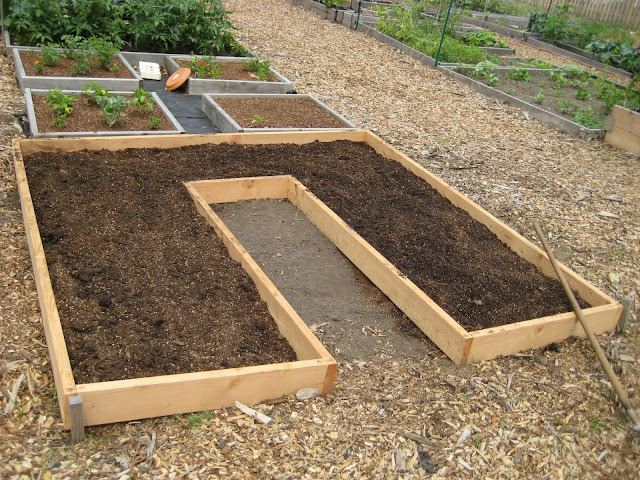 I’m sort of following Mel Bartholomew’s Square Foot Gardening method, so I wanted to do a soil mix of 1/3 compost, 1/3 vermiculite and 1/3 peat moss. You’re supposed to use a mix of different types of composts if you don’t make your own but I had a hard time finding any and ended up with mostly composted leaf soil and a bit of composted cow manure. Vermiculite is hard to find but a guy at the garden picked me up a bag at a nursery near where he works. Peat moss was the easiest to find. The proportions aren’t quite right but I think it’ll work out fine. I bought most of my plants at the farmers market. It’s a bit late to be starting most things from seed at this point. 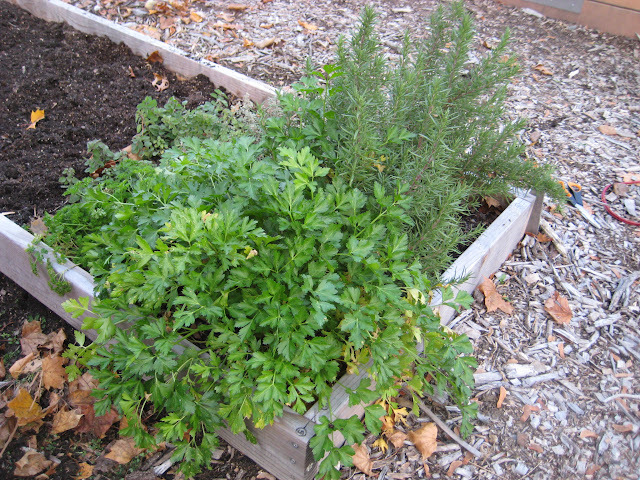 I planted zucchini, yellow squash, beans, plum tomatoes, 1 beefsteak tomato, red and green bell peppers, basil, oregano, rosemary, parsley and thyme. I also planted half a packet of edamame seeds. I will plant the other half in a couple of weeks to stagger the harvest. I still have room for more though so I’m still thinking about what else I’d like to eat. 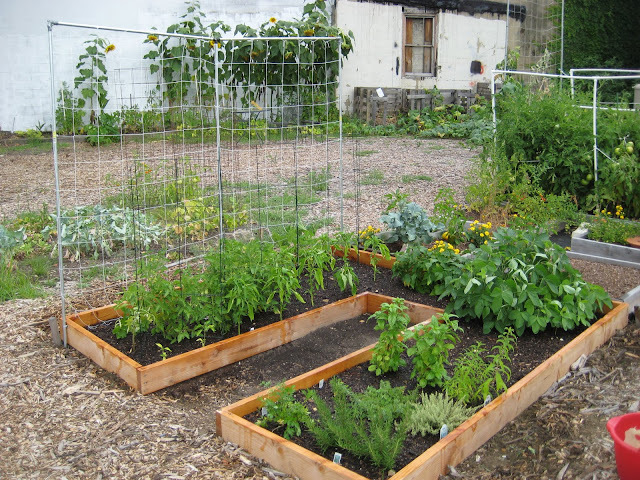 I still need to build one large trellis along the squash and add smaller ones among the tomatoes and peppers so I’ll be doing that next weekend. 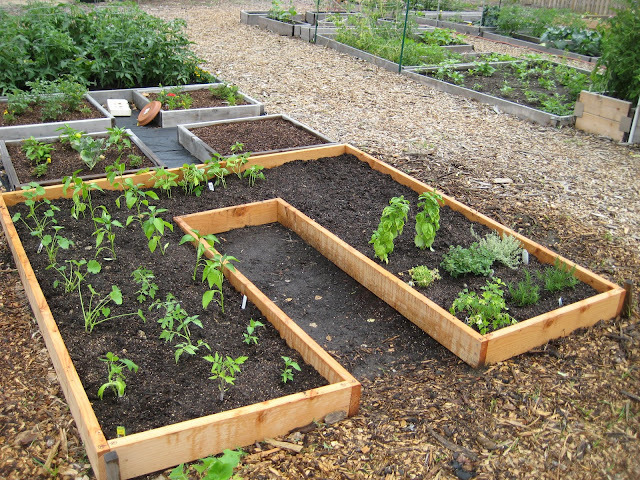 Besides that, all the work is done though and I just need to water and wait for my delicious veggies. Last year a friend of mine started a book club. It’s just six of us and we take turns picking books and meet once a month at someone’s house for dinner and discussion. Sometimes the cook tries to match the dinner to the book. This month was my turn and I decided to make everyone read Lonesome Dove since none of them had ever read a western before. And because I am who I am, I had to have a themed dinner. The main course was easy to pick: beef! (The book is about a cattle drive, fyi.) I’ve made this Glazed Corned Beef recipe several times and it’s delicious so I decided to go for it again. I like to throw baby carrots in there to cook too for the vegetable portion of the meal. 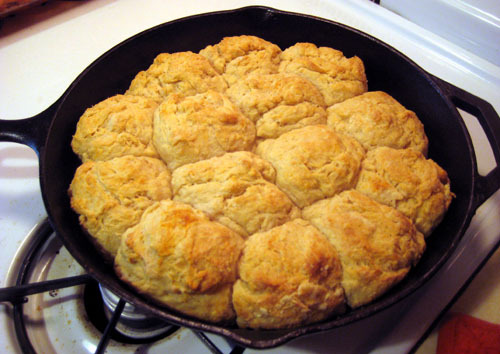 To go with this, I also wanted to make sourdough biscuits in my cast iron skillet. 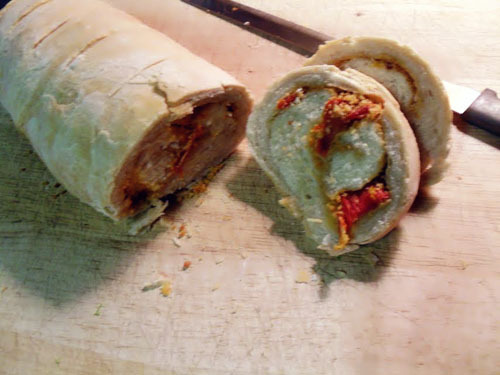 I got the recipe from my Forty Years Behind the Lid: Chuckwagon Grub by Richard Bolt cookbook. 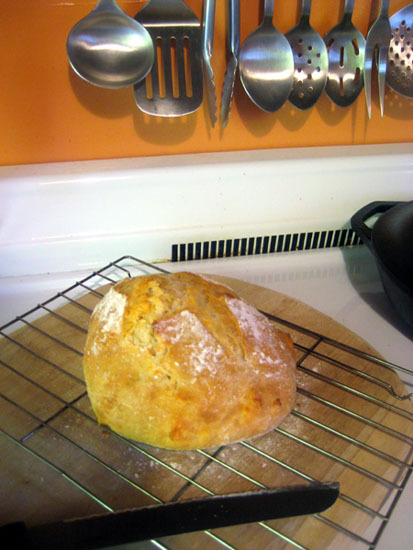 (Sourdough recipe is actually available online here). I made the sourdough starter only a night ahead of time since it has commercial yeast and raw potato to feed it. I halved the recipe and made it in a quart jar. It started bubbling pretty quickly and overflowed the jar constantly for about two hours before I finally scooped some off the top and put it in the fridge. Note for next time: quarter the recipe or use a larger container. Next was to figure out dessert and I was stuck between choosing vinegar pie or dried apple pie. The vinegar pie is also from the Richard Bolt cookbook (uses apple cider vinegar) so I know it’s good for cattle drives; this recipe has no eggs. 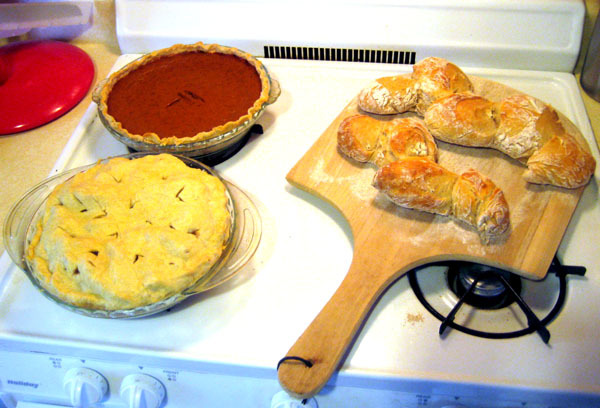 The dried apple pie is from MaryJane Butters’ Ideabook, Cookbook, Lifebook but it also has a custard layer and a meringue layer, and a cattle drive probably wouldn’t have chickens and a dairy cow. It’s more of a pioneer pie but I was eager to use some of the free bushel of apples I had gotten this winter from the farmers’ market and dried. “It’s … interesting,” he said, after his first mouthful. I thought it had a faintly apple juice-y flavor, due no doubt to that apple cider vinegar. Truth be told, it wasn’t the most pleasing flavor. I thought it a little peculiar. “Mmmm,” said Josh gamely, rubbing his belly in an attempt at appreciation. But if you were holed up in a dugout in Minnesota, ready to face the long winter, wouldn’t you appreciate the sweet end to a meal? Or if you were a sharecropper in Tennessee, looking to stretch your budget as far as at would go? It wasn’t okay. I slammed my hand down on the table and demanded he continue eating another SLICE OF HISTORY. He did. But I knew in my heart of hearts he was eating it because he was scared of me, not because he really liked it. The corned beef was good, as expected since I had made it before. The sourdough biscuits were probably my favorite item of the night, simply because I was unsure how well my starter would work; it ended up working beautifully. After I took it out of the fridge, I added more flour and water since it had shrunk a bit but it took a while for it to start bubbling this time. I had to use pretty much the entire quart jar of starter for the pan of biscuits so I really do need a bigger container if I want to be able to make enough to keep some starter for later, which is the whole point of having starter. However, I would be more likely to be making a small amount of biscuits or bread than a whole pan and therefore would need less starter on a daily basis. I actually will be trying a different recipe for starter next time that only calls for one cup each of flour and water so that would definitely fit in my quart jar. I would not make the vinegar pie again, at least not with that recipe. This recipe was cooked on the stove and I could not find any other vinegar pie recipe to compare it to; every other one I found was baked, some with meringues. 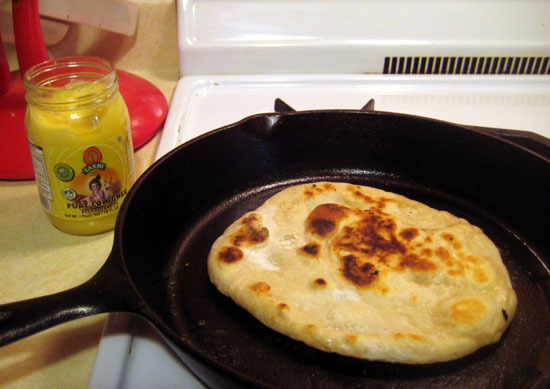 My first issue was that I was supposed to boil the liquids, then add the dry ingredients, including some flour. What happens when you add flour to boiling water? It clumps. I could not work out all of the clumps and I stirred this thing constantly for 20+ minutes. It also never thickened like I thought it should either. I eventually just poured it into the baked crust any way and stuck it in the fridge for a few hours. It wasn’t that bad after chilling for so long but I still wouldn’t make it again since it wasn’t especially delicious either. No one knew there was vinegar in it until I told them though. It just tasted like a sugar pie but slightly tart and appley. The dried apple pie was delicious. I love doing meringues and I loved the custard filling too. It’s a good thing I have lots of dried apples because I will definitely do this again. No one could tell the apples were anything but fresh. I did something new for my pie crusts. I’ve always just done a shortening-based crust but both the Barbara Swell pie book and my Rustic Fruit Desserts cookbook recommend a butter-based crust. The recipes are pretty much the same in both books. The butter crust was good but it was more trouble than my regular crust so I don’t know how often I’ll use it. If I wanted to be really authentic for tonight, I would have done a lard-based crust. Alas, there is no lard in my kitchen. 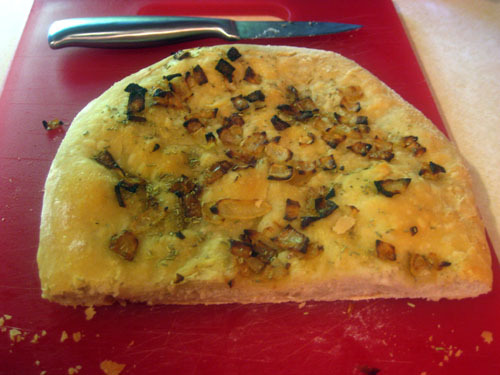 I do plan on doing a lard-based crust at some point because I hear it’s very tasty. I think only my family would be interested in trying that though. I’ve apparently been buying too many books lately because I just reached 1,000 for my library. A complete works set of Jane Austen hardcovers rounded it out. I know the number because of librarything, one of my favorite websites. (Incidentally, I just got runner up in a bookpile contest there that I entered over two years ago.) Why do I need more books? I don’t, particularly. But you can get almost any book used on amazon for $4 or less, and in good condition too. I got a still plastic-wrapped, signed, numbered, first edition hardcover for $4. This is generally why I try not to go into bookstores, and especially used bookstores or library sales. It’s so easy to walk away from those with oh, say twenty or more books per visit. At this point, I literally cannot cram one more single book into my bookshelves and I don’t have room for more shelves so I suppose I will have to stop. And all this at a time when everyone I know is getting a Kindle or Nook. While I think those devices have their place (good for travel, ability to search, nice to have everything in one minimalist place), I don’t think I will ever stop buying books. I don’t just love reading, I love books. I like having a physical book in my hands, I like collecting them, I think they’re pretty, and I especially like old books. Besides the fact that I think ebooks cost way too much, you can’t buy them used, and there are limited lending capabilities, you just can’t get the same feeling with a Kindle. Split Pea Soup – Could not find a ham bone at the grocery store but a friend had one in her freezer I could use. Next time, will check the butcher in town. I had to add twice as much liquid to cover the ham bone so I simmered it for a while longer to cook off the extra. Slow Cooker Turkey Breast – Except I ended up doing it in the oven because the turkey breast wouldn’t fit in my small crockpot. I also cooked it in some white wine and didn’t have any onion soup mix so made up my own. Note to self: get a dutch oven. Company Turkey Casserole – Had this at my grandparents’ house the week before and it was why I cooked the turkey breast to begin with, to have leftovers for this recipe. I also did this in my oven. Oven Roasted Brussels Sprouts – I never liked brussels sprouts before but these are so amazing. Butternut Squash Soup – Always a hit when I serve it. I only use one package of cream cheese. I also take all the seeds to roast for a snack later. Moroccan Spinach and Chickpeas – Saw this on a friend’s blog and it looked delicious. Warm Butternut Squash and Chickpea Salad – Had some squash leftover from soup making and had to try this after the reviews I saw. I was actually not a fan but I might try it again and tweak the dressing. Yam Smoothie – I had a yam to use and it looked interesting. Chicken Pot Pie – I made this before but not in a while. Yum. Red Potato and Cheddar Soup – Found some red potatoes in my cabinet that needed to get used. I left out the ham. The soup was okay but I think I’ll go back to my standard Herbed Potato Soup in future. Buttermilk Pie – My brother requested a couple of these pies for his firehouse. Butterscotch Pie – I did a graham cracker crust instead of pastry. I have to say, my meringue turned out amazing. I’ve only tried a meringue once before and it was a complete failure but I had some more tips this time and it was beautiful. Veggie Quiche – Nothing is better than quiche for breakfast. And of course, bread to go with all the soups. I also made the Oatmeal Pumpkin bread although I have no pictures. That was really, really good. I’ve made the master recipe a few more times as well since it’s just so delicious and goes well with everything. And speaking of cookbooks, another new favorite is Rustic Fruit Desserts: Crumbles, Buckles, Cobblers, Pandowdies, and More. This is right up my alley since I love old fashioned things and I love fruit desserts. It’s organized by season, so you can go right to the season you’re in and see recipes all made with fruits available at that time. 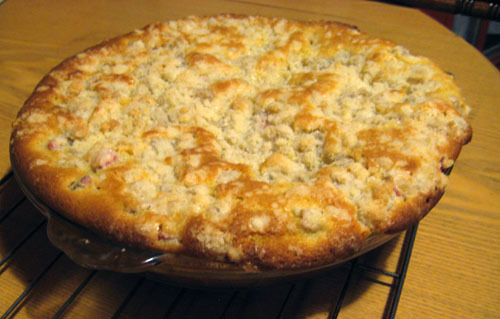 So far I’ve only made the apple cranberry oat crumble (which I very appetizingly called the “crapple crumble” to the people I served it to), the gingered pear and raspberry pandowdy (a new favorite recipe and likely to be repeated soon since I have leftover candied ginger), the cranberry buckle with vanilla crumb and the apple cobbler with cheddar cheese biscuits. I will probably be doing a lot more of the apple recipes over the next week or so since I got a free bushel of apples from my farmers market. To continue from my Artisan Bread in Five post, here is more bread!